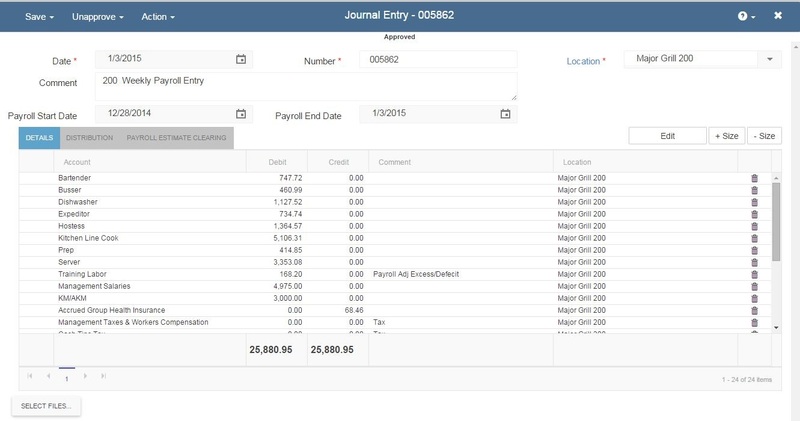 The Payroll Journal Entry window is used to record the journal entry from your outside payroll provider and at the same time ‘true-up’ the labor accrual entries that were created from the POS import each day of the pay period. There are two unique fields on the Payroll Journal Entry transaction that set it apart from the normal Journal Entry transaction. There is a place to enter the start and end date of the payroll period and there is a third tab on the grid called ‘Payroll Estimate Clearing’. When entering your payroll journal entry (from your outside payroll provider), enter the start and end date of the pay period in the Payroll Start Date and Payroll End Date fields. Make sure your transaction date in the header of the transaction is the same as your Payroll End Date. Next, import or enter the full payroll entry (as given to you from your outside payroll provider) on the Details tab. See the Journal Entry Import function for more details on importing journal entry details. Then hit Approve in the ribbon above. The Payroll Estimate Clearing tab will calculate and display the sum total of all the Approved labor accrual entries made by the POS integration (via the DSS) between the start and end date of the payroll period. Notice that it is essentially a single reversing entry on the last day of the payroll period. The difference between the reversing entry and the actual payroll entry (from your payroll provider) is shown on the Distribution tab. The amounts shown in the Distribution tab are the net impact to your labor related GL accounts. Location or Legal Entity - This clearing can either happen for the specific location selected in the Journal Entry header, or if your company does 1 payroll entry per legal entity then it can clear all locations for the Legal Entity in the same entry. To set your preference, open Preferences (Administration - Preferences in top ribbon) and on the 1st tab set the Payroll Clearing field to either "Per Location" or "Per Legal Entity". Note: Be sure to Approve all the DSS (Daily Sales Summary) records for the pay period prior to entering and approving the Payroll Journal Entry, as the Payroll Journal Entry window will only create a reversal for Approved labor accrual entries on DSS records. The smaller the amounts on the Distribution tab, the more accurate your accruals have been. If you note that there are large dollar values on the Distribution tab, you may want to adjust some of the accrual %’s on the Location setup. The accrual clearing amounts may also be larger than expected (or off) if the accounts assigned to Job Titles or to the location default accounts are incorrect. For example, the ‘Cook’ Job Title might incorrectly be assigned to FOH Labor in R365 but actual payroll entry from your outside payroll provider books the ‘Cook’ labor to BOH Labor so the amount shown on the Payroll Journal Entry Distribution tab would show the full amount going into BOH Labor and then the full amount coming out of FOH Labor. Therefore, be sure to review Job Title setup if the amounts on the Distribution tab are larger than expected. Date – This is the date of the Journal Entry. It defaults to the current date. For Payroll Journal Entries, it normally should be changed to the last day of the pay period for which the transaction is being recorded. Number - This is a system generated unique number assigned to this Journal Entry. Normally, you would not change this number. Comment – This is an optional comment field. Payroll Start Date – Enter the first day of the pay period for which this journal entry is being entered. Payroll End Date – Enter the last day of the pay period for which this journal entry is being entered. Details – Enter the full journal entry transaction as provided to you by your outside payroll provider. Distribution – One you have selected the Payroll Start Date and Payroll End Date, and entered the full journal entry on the Details tab, you will be able to see the ‘Net’ effect of this payroll journal entry to your GL accounts on the Distribution tab. The reason why this is not simply the values on the Details tab is because this transaction is also creating a reversing entry of all the labor accruals that have been made. Therefore, the Distribution tab displays the difference between the full payroll entry for the period and the reversing (or ‘Clearing’) entry of all the accrual entries for the period. Note: The values displayed on the Distribution tab should be relatively small if your accrual %’s are accurate. You can adjust the labor accrual %’s on the Location setup. Also, if your Job Titles are assigned to the incorrect GL Accounts (as described above), they may also be larger than expected. Payroll Estimate Clearing – This tab displays the reversing entry of all the labor accrual entries made by the POS integrations once the transaction is Approved. Note: Keep in mind that the individual daily labor accrual entries are not lost. The Payroll Clearing Entry makes a single reversing transaction on the date of the payroll journal entry for the sum total of all the accrual entries for the payroll period. After running payroll through your payroll provider, either import (or enter) a journal entry that has the summary of the expense accounts (i.e. FOH, BOH, Manager etc.) and a single line for each employees net pay (i.e. the amount that will clear the bank – each check) into Restaurant365. By doing this, we can use Restuarant365 for Bank Reconciliation for the payroll account and also capture the actual payroll expenses. Lastly, Restaurant365 takes this entry and uses it to offset the labor accruals that come in daily from your POS system into Restuarant365. So when you enter this journal entry above (or import it), you select the start and end date of the pay period for which it covers. The system then makes an adjustment to true up/down the accrued payroll expenses for the pay period. This way you get the benefit of having your weekly prime cost reports and having them totally accurate however often you run actual payroll.